The air-launched S-8OFP weapon is designed to destroy land and sea-based targets. Image courtesy of Rostec. The S-8OFP missile took part in the DefExpo 2014 exhibition held in India. Image courtesy of JSC "NPO" ALLOY. 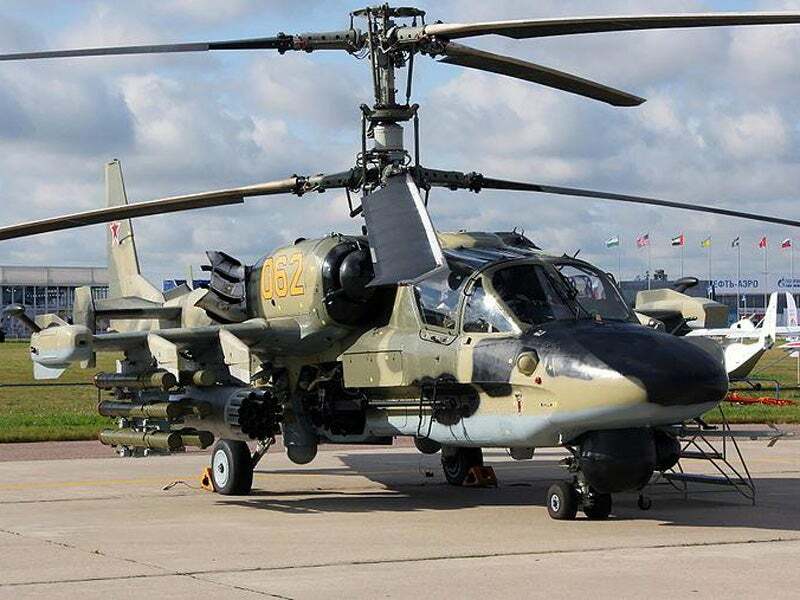 The S-8OFP unguided missile can be fired from a Mi-28N attack helicopter. Image courtesy of Vitaly V. Kuzmin. The S-8OFP rockets are carried in B-8V20-A pods. Image courtesy of Vitaly V. Kuzmin. S-8OFP (С-8ОФП) is an 80mm unguided rocket developed primarily for the Armed Forces of the Russian Federation. It is designed and manufactured by JSC NPO ALLOY, a division of JSC SPC TECHMASH, which is engaged in manufacturing armament and missile systems. The missile is an upgraded version in the 80mm S-8 rocket and is designed to be deployed from aerial platforms such as tactical military aircraft and combat helicopters, to destroy ground and sea-based targets in all weather conditions, both during the day and at night. The weapon can be fired at lightly armoured vehicles, modern main battle tanks, armoured personnel carriers, and surface vessels. It can also engage unarmoured ground-based targets such as launching units, radiolocation stations, missiles, and enemy personnel. The launch platforms for the S-8OFP missile include fighter aircraft such as Sukhoi Su-24, Su-27, Su-25, MiG-23, MiG-27 and MiG-29, and combat helicopters such as Mi-8, Mi-24, Mi-28, Kamov Ka-50, Ka-52, and other airborne platforms. The new-generation S-8OFP was introduced at the IDEX 2013 International Defence Exhibition held in Abu Dhabi, UAE, in February 2013 and entered service with the Russian Army in November 2014. The weapon system was exhibited during the DefExpo 2014 exhibition in New Delhi, India, and took part in the IDEX 2015. The S-8OFP-equipped Mi-28N and Ka-52 attack helicopters made their first combat sorties in Syria during April 2016. The 80mm S-8OFP missile’s cone-shaped nose section houses a proximity fuse and can be optionally equipped with a precision guidance system. The warhead is placed in the middle section and the propulsion unit is located towards the rear of the missile. Four control surfaces in the aft portion provide stability during the flight. The weapon has a maximum length of approximately 1.5m and a total weight of 16.2kg. It offers high reliability, improved operational efficiency and low operating costs. A hollow-charge and blast fragmentation, high-explosive, anti-tank warhead allows the missile to penetrate armoured vehicles and tanks. A pin, dual-mode fuse is used to detonate the warhead. "The missile is an upgraded version in the 80mm S-8 rocket and is designed to be deployed from aerial platforms such as tactical military aircraft and combat helicopters." The warhead weighs between 9kg and 9.5kg, whereas the weight of the explosive material is between 2.5kg and 2.9kg. A high-energy, solid-propellant, rocket engine powers the S-8OFP air-to-surface unguided missile, which has a firing range of 6km. The air-launched tactical missile system has all-weather capability and can operate in temperatures ranging between -54°C and 60°C when deployed in combat missions. It has the ability to destroy single or multiple targets located in an open area, in fortifications and forests. Development of the S-8 rocket family began in 1970. The rockets are operational with the Armed Forces of the Russian Federation and a number of foreign countries. They are carried in B-8M-1 and B-8V20-A rocket pods mounted on the aerial platforms. The B-8M-1 (for aircraft) and B-8V20-A (for helicopters) pods can accommodate 20 rockets each. The variants in the 80mm S-8 rocket family include S-8KOM, S-8 OM, S-8TsM, S-8KO, S-8PM, S-8DM and S-8BM.